Information: Norma Schwendener (1890-1947), author of books about folk dance. Enriched Teaching of Physical Education in the High School, A Source Book. [Woodring, Maxie Nan], and Schwendener, Norma. New York: Bureau of Publications, Teachers College, Columbia University, 1929. Folk dance on p.47-52. 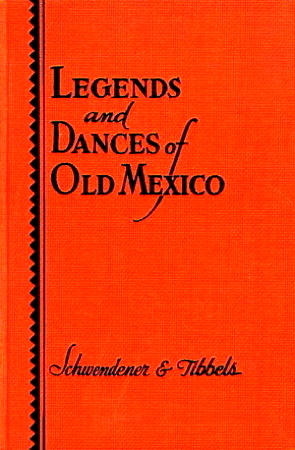 Legends and Dances of Old Mexico: How to perform the dances of Old Mexico: a manual of their origins, legends, costumes, steps, patterns, and music. Norma Schwendener and Averil Tibbels. New York: A.S. Barnes, 1933, 1934; Detroit: Blaine Ethridge Books, 1975 111p. (OCLC 4419423, 1934 edition: 551919, OCLC 19557538, 1975 ed.). Instructions for 12 dances. Singing Feet. Schwendener, Norma and Pulford, Bertha. New York: Teacher's College, Columbia University, 1938. Instructions and music for Dutch and German folk songs and dances. Illustrated. Tantoli.